The portrayal of science in films often gets mixed reviews. What’s your favorite science-themed film and why does it appeal to you? 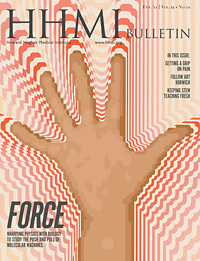 Easing the conflict between faith and evolution. Jeffrey Kieft has always been willing to step out of his comfort zone to make a difference. the HHMI early career scientist attended west point and served as an army tank platoon leader in Mannheim, Germany. Then he worked as a policy fellow at the White House. Now, in addition to running his University of Colorado lab, he engages church groups on the theory of evolution. he’s driven to advocate for science. I think the scientific community has to be careful that we don’t adopt the attitude that science belongs to scientists. We need the public to see some connection to their lives. The discoveries that we make really do belong to everyone and should be communicated. I don’t see this as service outside of my job but rather integral to the job. When I started as an army officer, I naively thought my goals matched those of all of my subordinates. I learned that everyone is motivated by different things. Motivating diverse people became a challenge I enjoy—in the lab and when I speak with the public. During a AAAS policy fellowship in the White House Office of Science and Technology Policy, I got a bird’s eye view of science. I saw that the public and policymakers don’t necessarily understand how science works. Many don’t see it as an investment in the future. That experience made me eager to speak at places such as church forums, Cafe Scientifiques, and community colleges. For me, talking to the public satisfies that itch to get science’s voice out there. When I read something in the newspaper or hear something that is an obvious misunderstanding or misstatement about science, I can’t not do something about it. But I don’t get confrontational. When speaking to a church group, for example, I don’t gear myself up for a debate. My goal is to find some common ground and move the discussion forward. I say, let’s examine evolution and see if it really must conflict with religion. I cover the basic tenets of evolutionary theory and, even more importantly, what evolution is not. I’ve been asked, “Isn’t the first rule of evolution that there is no God?” I reply, “Well, no actually, that isn’t in any science textbook.” Just teaching these basic concepts puts people more at ease because they’ve never learned what evolution means. To explain a concept like natural selection, I start with a story that everyone can understand. Imagine a valley where rabbits live with few predators. Then wolves move in and that pressure selects for survival and reproductive success of rabbits with certain genes, such as those that make them faster. Over time the rabbit population adapts to become better at evading wolves. If you understand that, then you understand a key part of what Darwin proposed. People also love hearing about vestigial structures—for instance, the fact that when you get scared, your hair stands on end. That’s a vestige of our ability to puff up and look bigger—that is, if we still had fur. We are still carrying in our bodies evidence of our lineage. I respect the view of a friend who is a pastor in Iowa. He says his faith is enhanced by a God clever enough to think up evolution. Some people are not placated, but if they go home and think about it or talk about it around the dinner table, then I’ve had a positive influence. And sometimes people ask questions that send me home thinking. Once, a woman asked, “If we are all evolved from common ancestors, us and gorillas and fruit flies, and I believe that humans have a soul, then when did the soul evolve?” I gave her the standard answer that science could not answer that. She replied, “But if my faith says I have a soul and the fruit fly doesn’t, and if we both came from the same thing biologically, how is that not in conflict?” That made me realize that, for some people, it is really hard to separate evolutionary theory from their faith. But, even with this challenge, if we as scientists don’t step out and say something—even in little bits and pieces and in small forums—then we’re shooting ourselves in the foot because the misinformation and antiscience voices win by default. 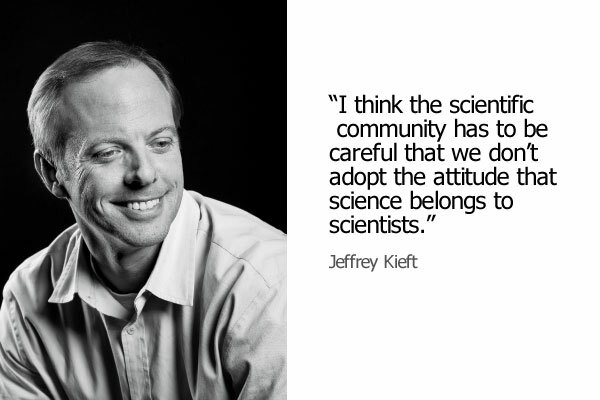 Jeffrey Kieft studies RNA structural biology at the University of Colorado Denver School of Medicine.